Saipan is the principal island and commercial center of the Northern Mariana Islands. It is about 12.5 miles long and 5.5 miles wide and has a total land area of 46.5 square miles, which is about the size of San Francisco. Saipan is slightly larger than Hong Kong but smaller than the District of Columbia. 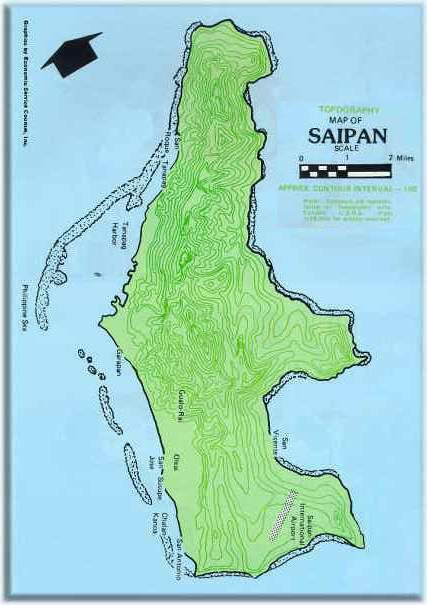 Saipan is four and one half times smaller than Guam, 120 miles south. Mt. Tapotchau at 1,554 feet is the highest point. The measurement from the floor of the Marianas Trench to the crest of Mount Tapotchau is 37,752 feet or 7.15 statute miles, (from sea level Mount Everest measures 29,028 feet). 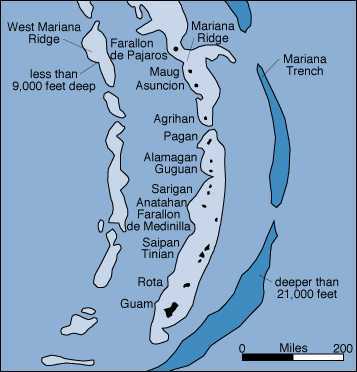 Saipan's 54-mile coastline is irregular except on the western side where there is a fringing reef. A large part of the island is public land. Saipan has 14 miles of beach. Of the 8 communities on Saipan, Garapan and Chalan Kanoa may be considered the principal urbanized areas. The population in 1995 was 52,698. Tourism and garment manufacturing are the major economic activities. Saipan is 120 miles north of the United States Territory of Guam. Saipan is one of 14 islands in the Northern Marianas archipelago that make up the United States Commonwealth of the Northern Mariana Islands. Human impact: pop. 12,366 (1973); heavily colonized and cultivated by Japanese 1914-1944; stripped of vegetation by WWII fighting; reseeded with Acacia; former administrative center of US Trust Territory, population center and capital of Northern Marianas. Ecosystems: scrub and secondary vegetation of Acacia confusa, Casuarina, and coconuts; grasslands; possibly cloud forest on Mt. Tapachau; many introduced species. Special Features: Lake Susupe; enclosed marine grotto; green turtle nesting on Tanapag beach; Tanapag Lagoon proposed as marine sanctuary. Anas oustaleti (Marianas Mallard) * group endemic, Lake Susupe and mangrove area north of Garapan, Endangered (RDB), not sighted since 1979. Megapodius laperouse laperouse (Marianas Megapode) group endemic subspecies, Rare (RDB), possible recolonization in late 1970s. subspecies, Lake Susupe, Rare (RDB), 2 reported on Lake Susupe (1975). Ptilonopus roseicapilla (Marianas Fruit Dove) group endemic, Guam, Rota, Tinian, Saipan, Vulnerable (RDB), uncommon locally (1977). The Ruby Seamount is a submarine volcano associated with the subduction of the Pacific Plate beneath the Philippine Plate. The seamount is located 25 miles (40 km) northwest of Saipan. The last eruption, detected by submarine hydrophones, was in 1966. In mid-October of 1995, anglers reported discolored water near the seamount. Personnel of the Wildlife and Emergency Management Office (EMO) of the Commonwealth of the Northern Mariana Islands visited the site and measured a depth to the volcano of 650 feet (200 m). Later, anglers reported "explosions" in the area. EMO personnel returned on October 25, 1995, and confirmed the submarine explosions. They measured a new depth to the volcano of 200 feet (60 m). This could be interpreted as vertical growth of the volcano of 400 feet (140 m) in a short time. However, since the type of navigation used by the ship is unknown, they may have made two measurements at different locations. An earlier tsunami alert for the islands of Saipan, Rota, and Tinian has been cancelled. Potential collapse of part of the volcano prompted the alert. Reports dated October 25, 1995 stated that the eruption had died down.